It’s time for our annual series of reviews and previews, discussing what we’ve found this past season, and what we’re looking forward to next season in new skis. This also marks the start of our annual ski request process. We’ll accept requests for new skis anytime. We travel to Europe to select skis in May, and again in August or September. We always encourage people to order early, so that we’re able to review the greatest selection of skis over our two trips. There will be some pricing changes (yeah, upward changes) in the industry this year, and we haven’t finalized everything about the ordering process. So I won’t point you at an order form right now. That will be an opportunity for a little more marketing in the coming weeks. 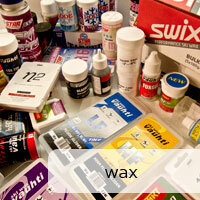 But if you’d like to get in touch to start discussing your needs, please contact us via email. 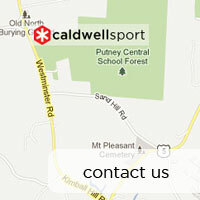 If you want a huge amount of technical information and multi-syllable words, contact Zach (that’s me) at zc@caldwellsport.com. 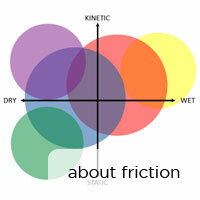 If you’d prefer a more abbreviated conversation with somebody who will use language you’ll understand, and keep things a bit more focused on you than on the specific dynamic rebound characteristics of the various laminate options and a variety of resting camber starting points… then you want to check in with Amy, at ac@caldwellsport.com. 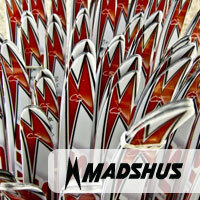 Fischer’s speedmax models have been stable for the past several years, without major changes since the spring of 2015. Our Fischer customers have been really satisfied with what the Austrian industry leaders have done. We’ve written extensive about Fischer’s designs and models in the past, and we invite you to browse our archives for specifics. We remain big fans of Fischer’s 610 Plus construction as a universal skate solution – we can select it in a range of camber variations to suite a wide range of conditions, and the 28 base remains one of the safest and most versatile base solutions in all conditions. We also remain big fans of Fischer’s 902 model classic skis as a broad range solution for all but the coldest hardwax conditions. We’re happy to discuss specifics with you anytime. But you’re probably more interested in the new stuff. 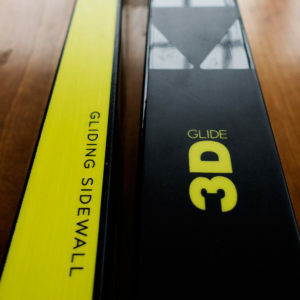 By now you’ll have seen pictures of next year’s Fischer Speedmax 3D skis, if you haven’t actually held them in your hands or tried them on snow. Fischer US sent out 5-pair “care packages” to all of their race dealers back in February, and we’ve had plenty of time to work with the new skis in the shop, and test them on snow. 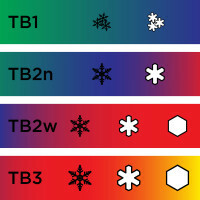 There are two changes to next year’s skis that are really notable. One is the addition of a “base-like” material on the sidewall of the ski. This is the update that has been garnering most of the attention, and is the focus of Fischer’s marketing push. Many people have noted that this is not a new idea. Fischer, as well as other brands (perhaps most notably, Karhu) played with this in the early ‘80s. This gliding sidewall innovation seems to have prompted two different reactions. Some people have enthused “this changes everything!”, while others respond with a “yawn – old news – they did this in the 80s and it didn’t do much then”. Neither of these responses is really going to tell the whole story. These changes don’t spring into existence without testing. 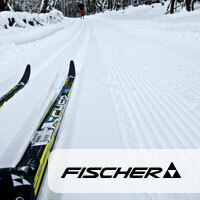 Fischer has been working with the gliding sidewall material for at least a couple of years on prototype race skis. Kris Freeman has had a pair in his fleet for the past two seasons, with a “PV6” designation stamped on the tip. 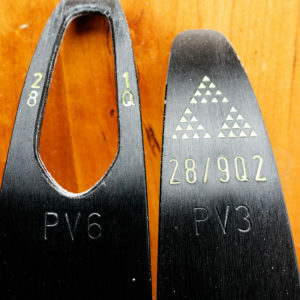 We also have some prototype classic skis with a “PV3” designation, which the race guys tell me is simply an earlier iteration of the idea, with a different sidewall material. So, not only has the idea been tested, but it’s been tested extensively, with multiple generations of prototype material, in a race setting. All of this is what we expect from Fischer. So – what have we learned about these gliding sidewalls in two years of testing and racing? 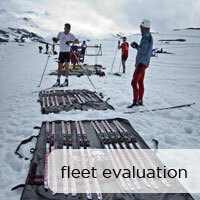 Well, particularly on the skate skis, there is no question that the pair in Kris’s fleet “feels good”. 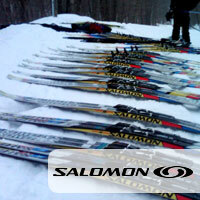 When he first tested the skis, the primary feedback was – “that is a really nice pair to ski on”. It’s also one of the most stable and edge-secure skis in his fleet. But not one of the fastest. It’s been a race-pick for Kris once in the past two years – at the Craftsbury Eastern Cup in December of this season. On that day we only tested it against one other pair, but it did very well for Kris in the race. I believe that the performance of Kris’s PV6 pair is more a question of its camber than the sidewall material. It’s got quite a high FA/HR value combination, and I selected it as a hard/transformed snow ski from the outset. It’s been fast in the intended range of conditions, but the feel of the ski is always good. Kris usually “wants” the ski to win because he likes skiing on it. But in the end, the speed is a factor of overall camber characteristics more than sidewall material. The other major change is the removal of the screw-retaining material in the core of the ski – Fischer has had a filler material in their air core to provide substance for binding screws to hold onto. It’s easy to forget a time when the skis didn’t have binding plates bonded onto them, but that screw-retention filler has been in there the whole time. And now it’s gone, which makes the skis substantively lighter. 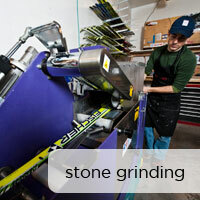 Again, this is a change to the material construction of the skis that has been prototyped and tested at length. 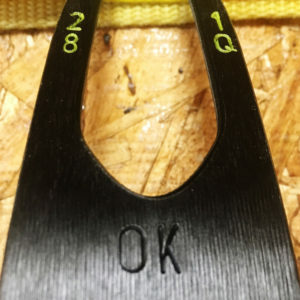 Kris has a pair in his fleet that have the “OK” stamp on the tip that designates the removal of that screw retention material. I don’t know what the “OK” actually means to the development department guys who put that stamp on there, but it’s given us some laughs. “Think I should try the ‘OK’ skis?” Ha ha ha. Like the PV6 skis, the OK skis have been… OK. They’re good in the conditions they were selected for, but that is quite wet snow, and Kris hasn’t done a lot of skating in wet snow, for whatever combination of reasons. I don’t think he’s ever raced on these. But they’re light and nice feeling skis. Our testing of the new skis has given us the feeling that the sidewalls produce a slightly “edgy” feeling compared to the previous material; as though the edges are sharper, or perhaps provide more edge security. It’s not a big difference, but both Amy and I have noted it independently. I did a little test of waxed sidewall material versus unwaxed sidewall material (using Vauhti UF Wet liquid paraffin in wet conditions), and was unable to feel any difference. 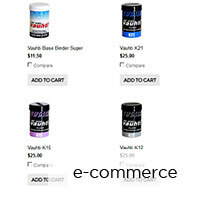 I don’t believe that waxed sidewalls are the story here, although now that Fischer is distributing Vauhti wax in Austria, and selling their own rebranded Vauhti liquid paraffin specifically for sidewalls, I guess we’ll see plenty of marketing, and everybody will be waxing them! Both Amy and I have also felt in testing that the new skis are noticeably lighter. 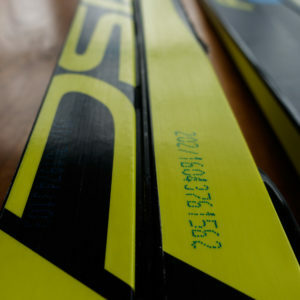 On the scale the 3D skis average out to weigh a bit less than the previous models. 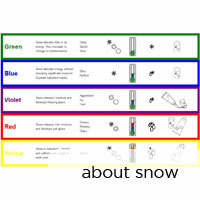 But it’s a ski to ski thing – the variation within a pair can be as much as 20 grams, which is similar to the difference between the old skis and the new skis. Overall, I’d estimate that the new skis can claim a 4-5% weight savings, and that is worth a bit. It’s clear that neither of these changes is going to make a decisive difference. These are incremental adjustments that represent marginal performance gains. Fischer is dominant in racing and in the market because you know what you’re going to get, and you can plan on it working. The skis were already great, and now they’re a tiny bit more great – slightly lighter, a bit more edge secure, and altogether still awesome. 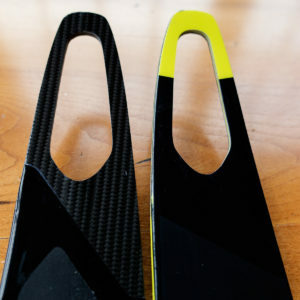 The carbon reinforcements at the tip and tail of the skis that were introduced when Fischer first came out with their Carbonlite models in 2006, are gone. They sort of needed some visible carbon at that time to support the name, and while they claimed that it reduced the weight of the tip and tail of the ski, I think it was mostly marketing. I don’t see any issue with this change, although at first glance it makes the Speedmax models harder to differentiate from the RCS, which has never had the carbon tip and tail. All in all, it’s not something to obsess over. The removal of the screw retention material means that there is nothing in there to… you guessed it… retain screws. They’ve got a warning printed right on the ski; “do not mount with screw bindings”. I assume this means that Fischer won’t extend warranty support to people who screw bindings on the skis. And given that there is nothing inside to hold onto the screws… I think that likely puts the nail in the coffin for SNS Pilot binding users on Fischer skis. I’m sure somebody will come up with a bodge-job that works, but it’s not a fight we’re going to take on. And finally, we can all look forward to a $50 price hike. The ski industry doesn’t tend to raise prices incrementally, year to year. But inflation happens, and prices will go up. So they go up when a new model comes out. To be fair, there are production complications with the new sidewall material, and I’m sure these cost a bit more to produce. But let’s not all lose our minds over whether we’re getting what we pay for with our extra $50. These price increases are inevitable and will continue to happen in the same fashion. 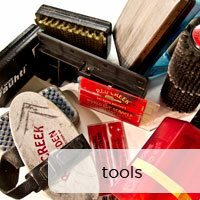 What we’re paying for is an entire development department dedicated to keeping Fischer at the front of the pack, and the introduction of new products that have already been tested and proven by the best skiers in the world. And if it makes you feel any better, $800 in 2013 (when the Speedmax model was introduced and the price was set) is now worth $868. So the price has actually gone down!